Today there are more CRM options than ever and that's awesome. The solutions push each other to be more functional and more affordable. Many solutions even offer freemium pricing. I don't think Salesforce.com's visionary leader and cloud computing pioneer, Marc Benioff, even saw that coming! Streak is a, currently free, app that allows you to have a CRM right inside Gmail! It's fairly customizable. Allowing you to make changes and additions to what you're tracking to meet the needs of your business, customers and deal management. You can even store documents like signed contracts! Along with sales, Streak also provides templates that help your team with bug tracking, customer support, hiring, or just a blank template to make your own. One of my favorite features is the ability to share with coworkers, partners, or even customers. 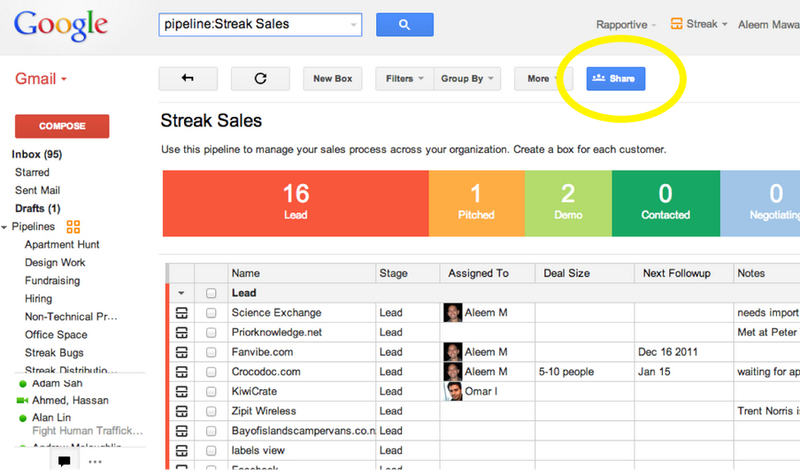 Sharing a Streak Pipeline works very similar to sharing a Google Doc. Streak allows you to associate contacts, notes, emails, and files with particular deals or other items you're tracking. Similar to apps like Right Inbox and Boomerang, Streak also allows you to schedule emails to send later - scheduled emails will show up in Drafts; Streak also provides Snippets which are extremely similar to Canned Responses (the Gmail Lab) although Snippets can be shared which is a very powerful feature. Streak even has its own keyboard shortcuts! The largest benefit of Streak is the ability to track customer or other information without ever leaving Gmail. If you give Streak a try, let us know what you think.